Is Malia Beach Hotel open year round? Malia Beach Hotel is open from the beginning of April until the end of October. Is Malia Beach Hotel situated near the nightlife district of Malia? The hotel is about a 10 minutes’ walk away from the nightlife & entertainment district. Malia Beach Hotel is situated in a quiet environment and has no problems with noise at night. Our hotel staff is Greek, English and German speaking. Check in is at 13.00h and check-out is at noon, 12:00. 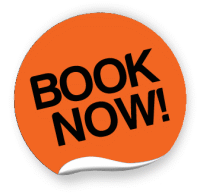 A late check-out can be arranged at a small charge on request and upon availability. Does Malia Beach Hotel provide parking space? Yes, our hotel has a free private parking space. We do have a lovely garden with trees and many endemic plants and flowers; we also have lawns for the kids to play on. Are pets allowed in Malia Beach Hotel? No, we're sorry, but pets are not welcome on the hotel premises. Personally we have nothing against them, but not all guests are charmed by pets. Yes, a bus stop is nearby (5 minutes on foot) and a taxi can be called at anytime. Shop opening hours vary, but are usually from 9am – 2pm and 5 – 10pm daily in summertime. Banks and post offices are open Mon – Fri from 08.00 – 14.00 hours. There are plenty of highlights and places of interest to visit in the area. Have a look at our web site's section Destination Info in the box below (Malia Info and Places of Interest). Heraklio, Crete’s capital, is 35km west of Malia (45min. by bus, 30min. by car). Heraklion International Airport is about 32km west of Malia. 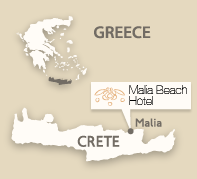 Malia Beach Hotel is right on the beach, while Malia village is within easy reach on foot (about 10-15). Shops and taverns are just a few minutes away. (See also Location).